If you need your Omnik inverter repaired, or it’s time to get it serviced, you only need to make one call. Service My Solar is your one-stop shop for Omnik inverter servicing and repairs. We guarantee honest advice and quality workmanship so that you can get back to enjoying solar power sooner. Omnik is a Sino-German joint-venture company combining German technology and Chinese manufacturing. 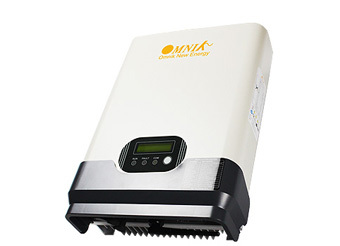 They offer a range of products including a single phase and three phase inverter – the OmnikSol – which comes in sizes 1.5 kW -5 kW, a micro inverter, and a hybrid inverter. Modern Omnik solar inverters are a complicated piece of equipment and so it’s essential that they are repaired properly. At Service My Solar, we use a thorough Omnik inverter service procedure to ensure your inverter is repaired quickly, correctly and in the most cost-effective way. In most cases, after our specially-trained technicians visit your property and inspect your inverter, they will source replacement parts from the manufacturer, repair the faulty parts themselves or recommend a new system. Certain types of faults can be indicative of an external cause rather than an internal inverter failure. Examples are Isolation Fault, Utility Loss and Vac Failure. If you encounter any of these faults, you may need to book a health check in order to eliminate external causes. Prior to contacting Service My Solar, you should check that your solar supply main switch (usually located in your main board or sub-board) is in the “on” position. Omnik offers a 5-year standard warranty, which can be extended to 25 years. Although they still honour their warranties, customers often experience lengthy wait times in receiving the replacement stock. To speed up the process, please contact us with the serial number located on the inverter, the fault code being displayed on your inverter, and the installation date. You will need to be prepared to send proof of purchase and photos of the inverter if requested. If your Omnik is out of warranty, we recommend booking in for a health check so we can try to repair it on site. If we are unable to repair it, then we will bring a replacement option to avoid extra site charges. Call 1300 496 278 to talk to one of our friendly technicians about service and repairs for your Omnik inverter. Alternatively, you can request a service online, by filling out the enquiry form below.